My Dogs Love Me: Run Free, Buchi! These past days (and weeks), I have been busy tending to Buchi's health needs. It has taken so much of my time that I didn't have time to blog. To put it more simply, wound creams turn into lotions because Buchi's skin breaks out into lesions with the lightest touch. Believe it or not, this is one of his "normal" days. This picture was taken last September 29, 2014. Since last year, Buchi has been battling an ailment we still don't understand. There were days he was completely healthy, and there were days that he was in terrible shape. At first, it was mange, Then, there was bacterial infection. Then, his eyes were too dry because of the bi-monthly Ivermectin shots the vet gave him. Taken last October 8, 2014. He became excessively oily and smelly, but it was a normal episode in our household. We were waiting for a next vet visit since it was just a couple of days later. It was a typical cycle for him to become worse, then real better, then worse, then better. Last month, I was so happy to tell the vet that we hadn't dealt with any oily or smelly conditions for an entire month. The vet was relieved that she told us that we could go a month without having the shot. Our relief was however short-lived. This month, Buchi was getting thinner, even when he was eating so well. Then, these past three days, he lost his appetite, and I was hoping that it was simply an upset stomach for all the licking--which is also normal. Today, we were planning to give our vet a visit, but he decided to take an earlier flight to the rainbow bridge. This picture was taken last August 23, 2014. 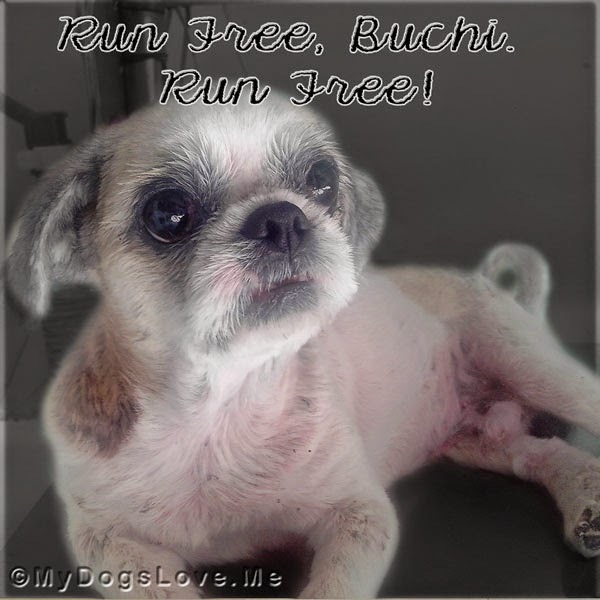 Run Free, Buchi! No more itchies and oily skin for you. I'm really sorry I haven't visited anyone's blog recently. Buchi has been an integral part of my life that somehow, it felt right that I spent most of my time with him. Thank you so much for your caring and understanding. We're so sorry for you. You tried your hardest to make Buchi's life pain and itch free. We're sure he knows you were trying to help him. Sounds like he was letting you know it was time to let him go. Run Free Buchi...you itch no more. Oh dear, how sorry we are hear to hear of Buchi's passing. You sure did try so very hard to help make his life better. Run free, Buchi. Say woof to Thunder and Dakota for us. Soft woos and gentle hugs to your family. Run free Butch. Your family loved you a lot..They loved you so much they listened to what you told them,,, to get you a pair of wings. I am so sorry your hearts are so empty now.. We sit beside you and hug you. Oh, Haopee, we are so sorry. Our hearts are broken at the thought of Buchi going to the Bridge. Thank you for loving him so much, and so well. Sending you all the most gentle and comforting purrs and prayers and hugs. Fly free, sweet Buchi. We love you always, little one. Don't you worry about us in Blogville we are here for you. We are so sorry to read that Buchi has been having such a bad time. We know how hard the decision you have made is. We are thinking and praying for you both. Our love and hugs from across the pond. We didn't know your Buchi but know how it is to lose a beloved boy. We are purring for you and hope you will take comfort in knowing that he is pain free and you did your best for him always. Trusting sweet Buchi will find peace and joy beyond the rainbow ~ purrs and prayers for those who had to say farewell to this brave little boy. 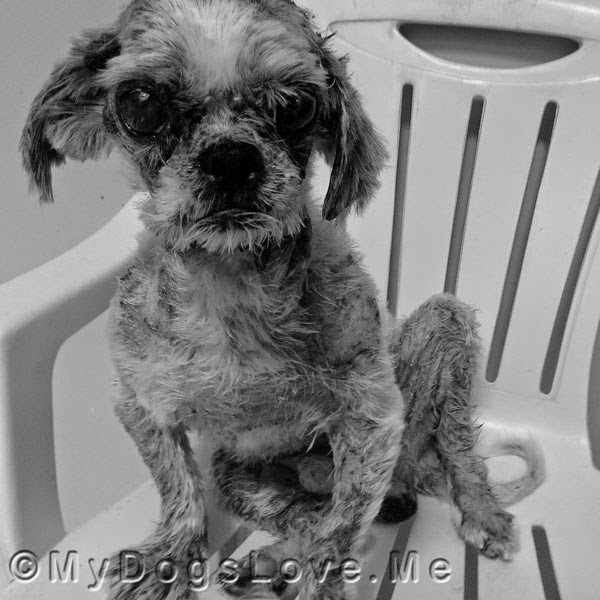 So sad that he had to endure such miserable health, but he did have someone who cared about him and diid all they could.....now he is sitting by your side as little Angel Buchi smiling at you and looking after you.......See you at the Bridge one day little guy! So very sorry to heart this news. Buchi is running free at the bridge now with all our blogging friends and I just know that my brother Weenie is running right along beside him. 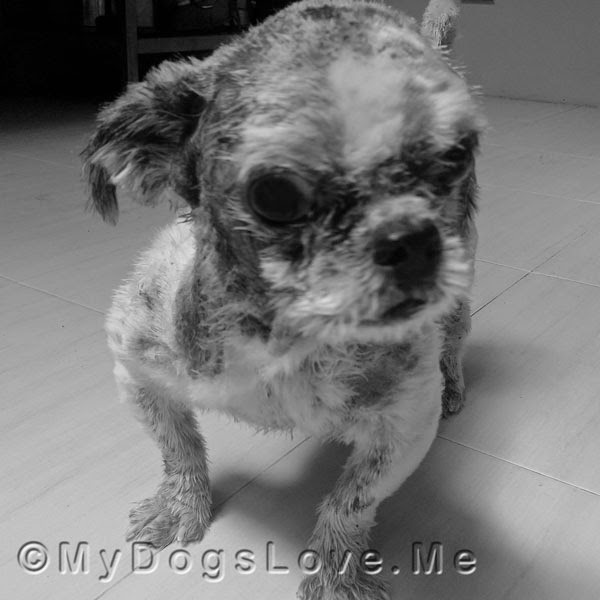 We were very sorry to hear that Buchi has gone to the Rainbow Bridge. He was so very lucky to have you to care for him and love him. Comforting purrs and paws of sympathy for your loss. We are so sorry to learn your beloved Buchi has left for the bridge. We send a warm hug, purrs and tail wags of comfort. We heard about Buchi and wanted to express our sadness. He seemed like such a sweet little fellow and had a wonderful gift in you for caring for him so well. sending you lots of hugs, purrs, and comfort. - Aland and Crepes . Run free Buchi! We're glad that you got to spend so much time with your humans before you left for the Bridge. We know you were met by so many of our angel furends. We are very sorry to hear about your sweet Buchi. We all send your hugs and all our love. I am so very sorry. Run free, Buchi. So sorry to hear about your sweet dog. Buchi isn't suffering anymore.. Purrs, hugs and prayers goes with our sympathies. Oh no Haopee. I'm so sorry. RIP sweet Buchi. May you run fast and forever free. This makes me so sad. Thinking about you and sending lots of hugs. Soft woos of incredible sadness. 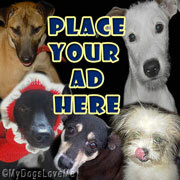 Feel our paws and arms around you in comfort during this time of such loss. Buchi, sweet little one, had a wonderful life with such a caring and loving family. We are so sorry he battled so many attacks on his little body. My Buchi and all of you know the peace of lives shared in commitment to each other and in joyful companionship. We pray that those memories will provide smiles and a reminder that love is forever.